On this winter’s day. Although the unseasonably warm winter in New York this year probably places our weather on par with San Francisco, I still find myself daydreaming about the golden state. Like many people I love San Francisco and I’ve always pictured myself someday living in the Bay Area. 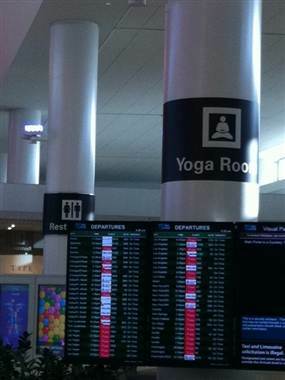 And now as if I needed another reason: San Francisco’s airport is opening a special “Yoga Room” next week. Located just past the security checkpoint in the recently renovated Terminal 2, the new yoga room is bathed in calming blue light, with a floating wall said to symbolize a buoyant spirit and enlightened mind. Lights in the room are low and warm — to counteract the bright concourse — and loaner mats are supplied. The Yoga Room is open from 4:30 a.m. to 12:30 a.m.
We driving up the California coast for our honeymoon in June, and are flying home out of SFO, so if I get the chance I’ll check it out and report back.